At its best, Mirror’s Edge plays like a Hollywood action movie; an exhilarating thrill ride that puts you in the middle of the chaos, yet always gives you a way to escape the bad guys in the nick of time. At its worst, Mirror’s Edge forgets the strengths of its first-person parkour and decides to ruin the flow of the game with cumbersome, combat-heavy sections. Developed by DICE, the studio famous for games focusing exclusively on bullet-laden warfare like Battlefield, Mirror’s Edge was definitely something that seemed to come out of left field. Could they create a relatively nonviolent game based around freerunning and parkour and turn it into something that fans of first-person shooters would demand to play? It was a risk for both DICE and publisher EA. While it never achieved smash-hit status it did cultivate a core of dedicated fans, and has managed to sell consistently (at a low level) since its November 2008 release. There’s obviously something about the game that manages to draw people in. What is it? Mirror’s Edge is set in the City of Glass, which is populated a dystopian society that has been built in the ashes of violent upheavals. The People In Charge are the bad guys from this past conflict, and impose their will on the citizens of the city. Surveillance is omnipresent, the words and deeds of every citizen are scrutinized by the Citizen Protection Force (CPF). Though the oppression of the People In Charge looms heavily, there are those who peacefully strive for change. The only way for these dissenters to exchange confidential communication is through the employ of runners, who hand-deliver physical messages via the framework of the city’s rooftops – above the normal patrol routes of the CPF. 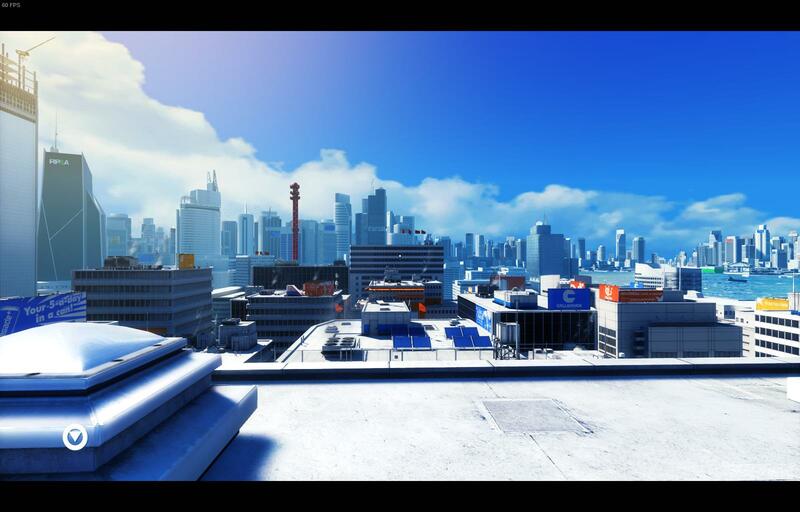 You will experience Mirror’s Edge through the eyes of a character named Faith, a runner. Your opening missions begin as basic delivery assignments with minor entanglements, but things quickly become more complicated. Faith’s sister Kate, a CPF officer, has been framed for the murder of a prominent politician and now it’s up to Faith and her band of outlawed runners to find out what really happened. Poor Robert isn’t looking so good. See that red radio tower way back there? That’s where you’re going! Most levels start somewhere on the roofs of the City of Glass. Your guide, Merc, communicates with you via headset to give you your bearings and objectives. Missions begin with him directing you to move towards some far-off landmark that you can see, but can’t quite pick out an obvious route to from the current vantage point. It’s up to you to figure out how to climb, sprint, jump, shimmy, crouch, and take flying leaps to get from one end of the level to the other. Despite the wide-open feel of many of the game’s environments, it is definitely not open-world. On the contrary: every level is carefully scripted and controlled, but those invisible barriers are hidden well enough so as to give the illusion of freedom. Merc will occasionally provide audio cues as to where you’re supposed to go, and the rest of the time it’s up to the game’s stunning visual design to direct your path. 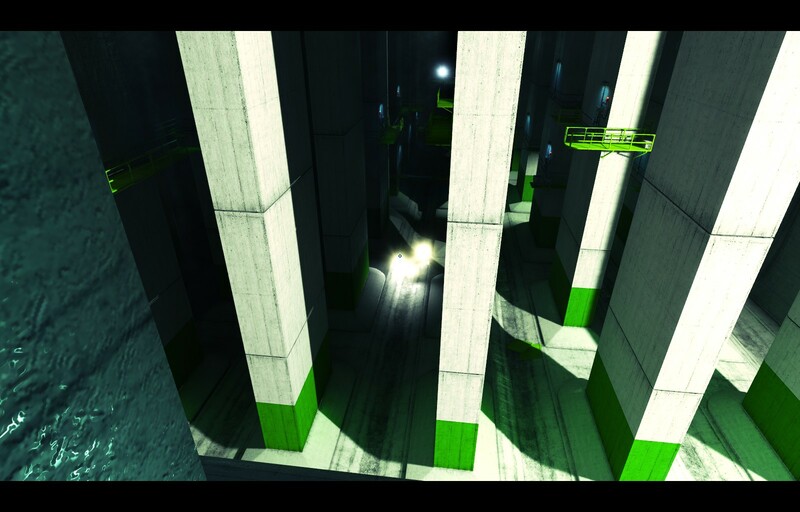 Mirror’s Edge smartly uses a vibrant but minimalist color palette. Rooms and even entire buildings are frequently washed in shades of the same color, providing a simple but crisp look that makes the world easy to navigate when running through it at full speed. Colors are chosen carefully, especially things that are red. 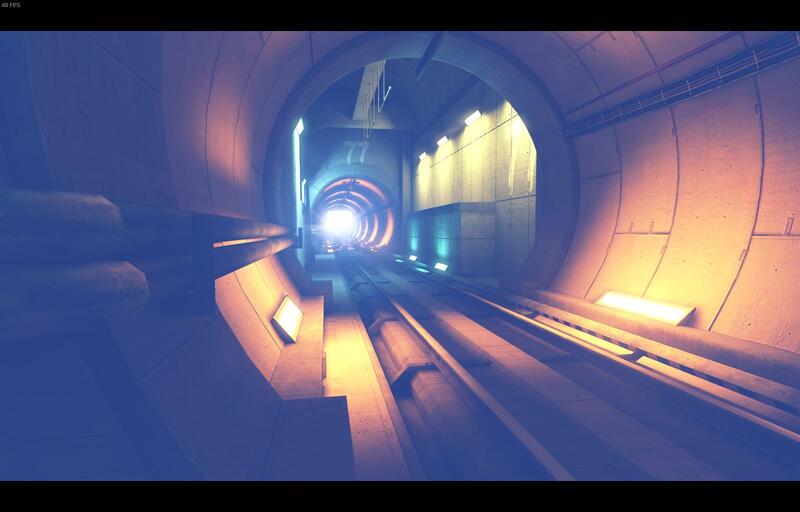 Red objects; doors, valves, buttons, walls, crates, or other objects; comprise what’s called “runner vision”. These red visual indicators smartly guide the player through the level, providing a sense of direction with minimal confusion. Not sure where to run? Run at red! While for the most part Runner Vision does a good job at leading you to your objective, sometimes you get lost. Very lost. Sometimes you’ll catch a glimpse of red in the distance, but get caught between some obstructions and lose sight of your destination. Other times you may only have one or two directions in which to go, but you haven’t gotten close enough to a particular object to trigger it to turn red. At times runner vision seems to be dependent on the player maintaining momentum in the direction they’re supposed to go, and falls apart when the player loses their way. Other times you’ll be in a large, complex area with no idea how to get there. You may see your ultimate destination, but your only option is trial and error while you discover the route. Part of my frustration with navigation stems from the fact that I’d forgotten that the game has a hint button. Press it, and Faith will look in exactly the direction you need to go. Most of the time, though, it works well enough for you to be able to keep a breakneck pace. But this is where I need to point out a caveat for Mirror’s Edge: I can’t remember how enjoyable it was to play through for the first time. Sometimes it is legitimately difficult to know where to go. If you’re on a level with a slower pace and there aren’t any CPF following you, just backtrack a little and do some exploring to discover what you may have missed. If you’ve got half a dozen cops on your heels taking shots at you, losing your sense of direction is just adding insult to injury. Heck, there are certain sections that vexed me though I’d already played them multiple times. Specifically, there’s a bit where a helicopter gunner tries to mow you down as you navigate some scaffolding. It’s quite reminiscent of the cliffside level with the helicopter from Half-Life, except here my only option is to find the proper path to take in order to make the helicopter go away. No laser-guided RPGs here. But by and large, the level design is good enough that combining it with tight controls means first-person parkour is legitimately fun. Faith’s move set is more than adequate for any obstacles you’ll encounter in Glass City. She can do everything expected for a game played from the first-person perspective; run, turn, strafe, jump, crouch. Mirror’s edge also adds a few moves that aren’t present in other games. Pivot is one of them: hit a button to quickly turn about 180 degrees. She’s also capable of climbing pipes and certain grates, swinging from certain overhangs, and slipping sideways through narrow gaps. Faith’s movements are quite versatile because they may vary based on the context. While jumping or falling, hit crouch just before impacting the ground to break your fall and neatly roll upon landing. Sprint alongside a wall and jump to start wall running. Sprint at a wall and jump towards it to plant on it, then pivot quickly face your direction of origin and jump again to reach a high ledge you wouldn’t be able to otherwise. The game gradually introduces you to these moves so that they come naturally when you do need to use them. All of these moves fit into the game world perfectly, and with a little practice you’ll feel like you can fly through each of the game’s environments. While a lot of the game takes place on the rooftops, a considerable amount of it occurs in indoor or subterranean environments. Surprisingly enough, those more enclosed areas felt more dangerous to me than being on the rooftops. When starting out at a high vantage point like the top of a building, the game takes away the player’s connection and sense of danger from the heights at which they travel. But other levels that start the player at ground level and make them climb to dizzying heights feel more perilous because every step takes them farther away from the safety of the ground. I don’t have a fear of heights, but Mirror’s Edge gives me the next best thing. Pay no attention to the fact that Faith can clear 40-foot gaps between rooftops with ease. It’s fun! In addition to the parkour moves, DICE incorporated hand-to-hand combat mechanics for the inevitable confrontation with the authorities. You’re limited to light punches and light kicks while stationary, or heavy kicks that must be initiated while running. Also at your disposal is the ability to disarm your foes, but this is a special attack that must be triggered in reaction to an enemy’s specific movement. The window for disarming is very small, and you’ve got to have quick reflexes to pull it off successfully. An ability called “reaction time” exists to help you with this. It’s essentially the same as Bullet Time from Max Payne or The Matrix: the ability to slow down game events so you can react faster. Unfortunately, it just doesn’t work all that well. Since the window for disarmament is so narrow, you’ll either initiate reaction time too early and miss the opportunity, or you’ll wait too long to push the right button and miss the opportunity altogether. The game never references reaction time outside of the tutorial, so I honestly forgot it was available to me almost the entire time I played. Combat in the first few levels isn’t bad at all and even winds up being a little bit fun. Sporadic encounters with lightly armored, handgun-toting CPF give you the freedom to choose to engage or simply run away. Even if the game design implied that it wanted to you chose one option more than the other you could still try either route and have some success. There’s something satisfying about running full-speed at a hostile and performing a slide kick to knock them off their feet. Sadly, as the game progresses not only will there be points where there’s no alternative to fighting, but you’ll be locked in a small area and forced to deal with multiple heavily armed soldiers. For example, there’s a mission where you’re forced to walk into a small warehouse with four SWAT troopers. They’re wearing full suits of body armor and are armed with heavy machine guns. When you enter the room they are patrolling on catwalks above you. They know where you are, there’s no clear way out, and you have no other obvious options available to you. Even once you explore the room enough to know where you’re supposed to go, the exit is tricky enough to reach that you can’t possibly access it without becoming a bullet-ridden corpse. So your only option is to fight through FOUR swat troopers in a small environment. It took me about ten reloads before I finally memorized their spawn locations and was able to pick them off one by one. It’s possible to do, but not in the organic way that the developers intended. It’s situations like this where combat is your only option that exposes the limits of the fighting system. For a game that tries so hard to trick you into thinking you can freely run and perform awesome parkour moves in an open-ish world, trapping you in a warehouse and forcing you to fight stands in stark contrast to the strength Mirror’s Edge exhibits. But it gets worse. Later that same mission, you’re introduced to an all-new type of an enemy. This comes at a pivotal point in the plot of the game. Faith has discovered a brand new threat to herself and the other runners she cares about, and now she’s face to face with not one but two of these new threats in what I thought was a closed area. Since only a few gameplay moments prior to this revelation I had been locked in a warehouse and forced to fight my way through, I logically assumed that combat was my only option here as well. Wrong. Despite these two new foes being outfitted with only a taser and significantly less armor than the SWAT team I just knocked out, I was unable to put either of these new baddies down. It didn’t matter that I could land about twice as many hits on them as the heavily armed guys. The game apparently decided that I was supposed to run instead of fight, but I hadn’t gotten the message. Instead of feeling the thrill of the chase and a sense of relief when I finally reached safety, I couldn’t help but be annoyed at the seemingly arbitrary distinction between fight and flight situations. Unfortunately for the game, the emphasis on combat grows with each passing level. Gone are the easy and satisfying fisticuffs of the early levels. Present are a few levels of high-pressure running with annoying unbeatable foes nipping at your heels. With every combat situation that’s forced on me, the more I realize just how shallow the combat mechanics are. Your opponents eventually start blocking your attacks, but you aren’t granted the same luxury. Fights devolve into irritating cycles. Take a few hits, run in circles around your opponents while your health regenerates, and then go for a slide or jump kick, and repeat the process until they go down. 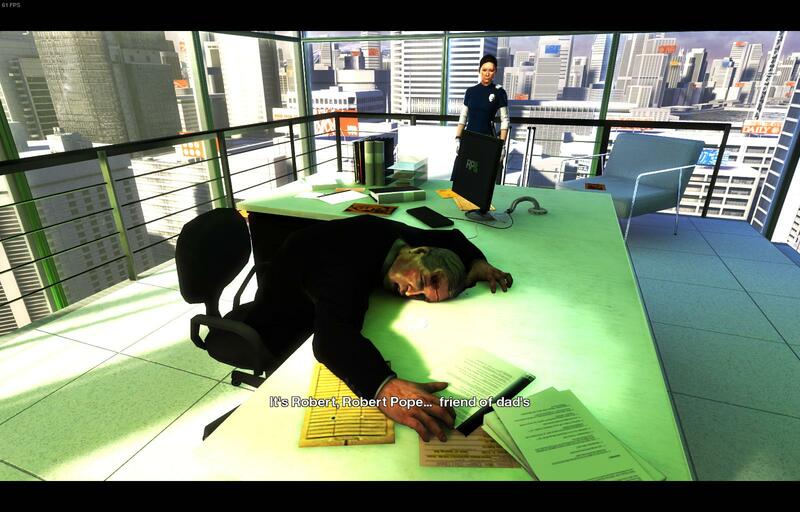 It’s times like this I’m thankful I’m not playing the Xbox 360 version of the game. See, the version for Xbox comes with a whole slew of different achievements to challenge you to play the game differently than you might otherwise. One of those is called “Test of Faith”, which is awarded when you complete the game without shooting an enemy. Regardless of the merit or skill required to earn specific achievements, people like myself will subject themselves to all kinds of gaming torture to earn points that don’t really mean anything. In the Xbox version of the game, the brand of torture meant either avoiding combat altogether or using only hand-to-hand combat to dispatch your foes. The Steam version of the game doesn’t have achievements. Ergo, there’s no real reason not to pick up a gun from the CPF officer you just knocked out and shoot some bullets back and the fools that have been shooting at you the whole game. In an attempt to discourage players from using guns unless absolutely necessary, DICE wisely placed some gameplay handicaps on Faith when she’s packing heat. She can’t run or perform any parkour moves, nor can she reload the gun or even indicate how many rounds are present in the magazine. In spite of those limits, her aim is pretty good and it’s not too difficult to take out anyone that might be giving you trouble. Lesson learned: Don’t make Faith angry. The days of peaceful running are over. It’s time for violent rebellion! Though Mirror’s Edge has some cracks in the experience, it’s worth suffering through the bad moments to experience the thrills. The police, always alert to what happens in the City of Glass, are on their way and I’m running; always running. My position on the rooftops leaves me exposed and I have to make my way down towards the surface if I’m to find any path of escape. A construction site leads me into in an abandoned subway station. Scaffolding and halfway remodeled hallways leads me to a series of giant air exchange vents. Taking these deeper into the underground leads me to the subway tunnels. My path now includes some well-lit subway track; these lines are active. I move forward to go through the tunnel when the deafening blast of an horn knocks me back and a gigantic subway train roars by. These lines are active indeed. There’s a glimpse of red off in the distance to my left. The subway trains and I have to figure out how to share the tracks. Utilizing whatever maintenance access I can, I work through and around the tracks. Eventually I find myself in a room with a catwalk running parallel above the track and a door at the end. Blue sparks start flying away from the door and I stare at it for a moment before I realize: The CPF know where I am and are cutting their way onto the catwalk. “The trains, Faith! Take the trains!” Merc’s voice sounds urgent in my ear. I’ve spent the past ten minutes frantically running down subway tunnels trying to avoid the trains at all cost. Now, they were my only salvation. At the far end of the catwalk, the blue sparks have completed their slow circuit around the door and it’s blown off its hinges. Tactical police burst through sporting submachine guns and riot shields. Trains it is! I time my jump over the catwalk’s railing and make a hard landing on the end of a speeding subway car. I’m safe now, right? No. It’s time for a solo reenactment of the end of the movie Speed; Ducking below ceiling mounted signals and carefully timing jumps over low-clearance catwalks. Before long I need to jump to an adjacent subway train, again being careful of my surroundings and timing my jump so as not to wind up impaled on the support pillars whizzing between the trains at regular intervals. Soon after, my new ride is shut down by the authorities… but there’s still another one coming full-speed at me. “Get out of there, now!” Merc is yelling at me in panic. I run back in the direction the subway came from, frantically looking for an escape. Some ways ahead there’s a red door in the side of the tunnel. As soon as I notice it the glare of headlights from an oncoming train fills my field of view. Sprinting with singular focus toward the door, I jump through the opening and turn back to watch the newly arrived subway train smash into the first, mere seconds after I reach safety. Just another day in the life of a runner. Resist the urge to fight. The game is about running, not fighting. Don’t fret too much about which jumps you can or can’t make; it’ll become intuitive in time. Play through the game at least twice; it’s better the second time around.